One of the many ways technology has changed our lives is helping seniors live independently, says Lynn Wilson, Founder of The CareGiver Partnership. This, in turn, makes caregivers’ jobs a little easier. 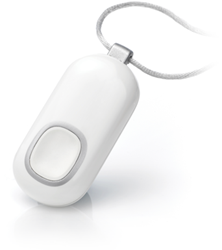 Lifeline is a wearable pendant that can be manually operated or auto-alert after a fall is detected. Our goal is to help others be proactive about helping seniors remain in their homes as long as possible, in a safe and secure environment. A new wearable device helps seniors and their caregivers keep track of their health. The Tempo wristband tracker logs a senior’s daily activities and identifies early warning signs of health issues, which typically begin as changes in normal behavior patterns or activities. Tempo is one of many tools that help seniors safely age in place while providing their loved ones with greater peace of mind, says Lynn Wilson, Founder of The CareGiver Partnership, a national online retailer of incontinence products and other home health care supplies. An amplified telephone not only helps the hard of hearing, some are designed to also assist the visually impaired. Features to look for include extra -loud ringers and answering machine playback, talking caller ID and keypad, flashing ring signaler, big buttons with backlighting, one-touch memory dial and emergency numbers, and hearing aid compatibility. Family members and friends who suspect a senior has lost mobility and is no longer safe alone at home should consider monitoring devices, such as Philips Lifeline. Auto-alert services like Lifeline can be manually operated or even place a call for help if a fall is detected and the pendant wearer is unable to press a button. The pendant is waterproof, always charged and stays within reach. There is a monthly fee for the Philips Lifeline service, but customers of The CareGiver Partnership receive free activation. In-home monitoring is a fast-growing area of elderly care. Motion sensors on front doors, furniture, appliances and even pill bottles alert caregivers to changes in routines. Fall monitors, such as the Posey Keepsafe, work with pressure sensors on beds or chairs to alert caregivers to abnormal movement. Telemedicine — two-way interactive communication between patients and health care providers using an Internet connection — provides seniors with access to life-saving care. Telemedicine can save time and transportation costs, reduce the need for 24-hour monitoring by family members, and help improve the patient’s mental status through independent living. It also improves the outcome in time-sensitive cases such as monitoring stroke symptoms. The quicker a patient is diagnosed and sent to a hospital for treatment, the better the outcome. Of the one in three adults over age 65 who fall every year, 20 to 30 percent of them will suffer moderate to severe injuries as a result, according to the U.S. Centers for Disease Control and Prevention. The CareGiver Partnership offers a free guide to preventing falls by staying healthy, making a home safer and taking advantage of personal safety tools. And visit The CareGiver Partnership blog for hundreds of articles of interest to seniors and caregivers. The CareGiver Partnership is a national direct-to-consumer retailer of home healthcare products for incontinence, diabetes, nutrition support and more. In its eighth year of providing products and services that help caregivers and loved ones maintain personal dignity, the company also offers an online library of more than 1,500 family caregiver resources and personal service by experts in caregiving. Call 1-800-985-1353 or visit online at caregiverpartnership.com.